Subject: Congratulations!!! Your E-mail Has Made It a Winner. Congratulations!!! Your E-mail Has Made It a Winner. We are delighted to inform you of your prize release on the 12th of December 2007 from the Australian International Lottery programme, which is fully based on an electronic selection of winners using their email addresses from some site. 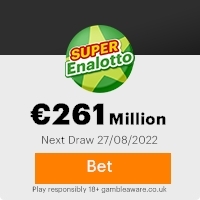 Your email address was attached to ticket number; 675061725 9356460902, serial number 67749137002.This batch draws the lucky numbers as follows 2-9-23-35-46 bonus number 14, which consequently won the lottery in the first category. You hereby have been approved a lump sum pay of US$400,000.00 (FOUR HUNDRED THOUSAND DOLLARS) in cash credit file ref: ILP/HW 46704/03 from the total cash prize shared amongst three lucky winners in this category. Further more your details (e-mail address) falls within our European representative office in Amsterdam, Holland, as indicated in your play coupon and your prize of US$400,000 will be released to you from this regional branch office in HOLLAND. We hope with part of your prize, you will participate in our end of year high stakes for US$1.3 Million international draw. Simply contact our Regional Claims Office under the African Payment Center where your winning falls. To file for your claim: Please quote your reference, batch and winning number which can be found on the top left corner of this notification as well as your full name, address and telephone number to help locate your file easily. For security reasons, we advice all winners to keep this information confidential from the public until your claim is processed and your prize released to you. This is part of our security protocol to avoid double claiming and unwarranted taking advantage of this programme by non-participant or unofficial personnel. Note all winnings must be claimed before 24th of December 2007 otherwise all funds will be returned as Unclaimed and eventually to the Australian National Treasury. This Email with the Subject "Congratulations!!! Your E-mail Has Made It a Winner." was received in one of Scamdex's honeypot email accounts on Tue, 11 Dec 2007 19:03:01 -0800 and has been classified as a Generic Scam Email. The sender shows as "Australian Int l Lottery" <aulotomate1@aol.in>, although that address was probably spoofed. We recommend that you do not attempt to contact any persons or organizations referenced in this email, as you may expose yourself to scammers and, at the very least, you will be added to their email address lists for spam purposes.